Steve’s career extends back to the 1980s when he helped develop and manage forest inventory GIS data for DNR and county lands. Since that time he has become the GIS supervisor for DNR Wildlife, developing and managing the Wildlife GIS Program. 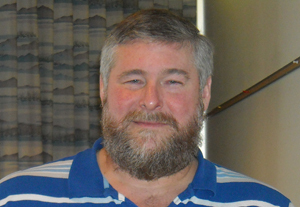 He has served on many DNR GIS/IT technical, policy, planning and standards committees and state GIS related committees, beginning with the 1989 (proto-GIS Consortium) NRGIS Forestry Committee to the Standards and Emergency Preparedness Committees of the Governor’s Council on Geographic Information. Steve has been a leader within the GIS/LIS Consortium, serving on the Board and Conference Committees for more than a decade, as well as contributing many conference presentations and newsletter articles. 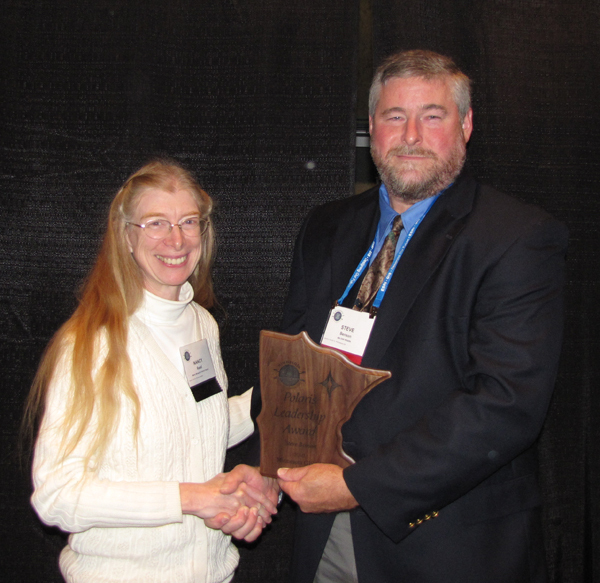 Steve helped Itasca Community College (ICC) develop a 2-year GIS curriculum, and served as an Adjunct GIS instructor. He has worked tirelessly fundraising for the Consortium Scholarship fund, and mentoring student interns. Steve’s passion for geospatial technology, community building and GIS education spills out well beyond his job duties. 2010 Polaris Award recipient Steve Benson with 2009 Polaris Award winner Nancy Read..